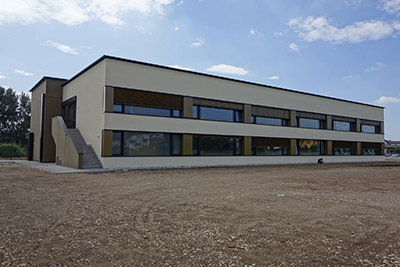 The project is an interesting school building passive house certified. The Municipality of San Giovanni Lupatoto (Verona) ordered and holds the building. High thermal insulation level of the building envelope is completed by external movable solar blinds and a decentralized mechanical ventilation system with heat recover well integrated in windows and façade components. This offers high aesthetic quality and high potential in control of indoor air quality and energy saving related to the ventilation. A building management system allows for comprehensive automatic control of ventilation system, solar shading devices and other functions.